The SFP (“Small Form-factor Pluggable”) may be the smallest sized optical transceiver utilized in optical communications. It interfaces a network equipment mother board to some fiber-optic or unshielded twisted pair networking cable. This is probably the most diverse transceiver format available with a number of different transmitter and receiver types, allowing users to select the appropriate transceiver for each connection, and to achieve the required optical reach within the available optical fiber (e.g., multi-mode fiber or single-mode fiber). The way in which the SFP transceivers are mounted on the motherboard, utilizing a suitable cage, allows for a “hot plug” insertion or removal. Optical SFP modules are commonly obtainable in a choice of models: 850 nm (SX), 1310 nm (LX), 1550 nm (ZX), and WDM, both DWDM and CWDM. SFP transceivers are also available with a copper cable interface. The copper SFP allows a host device designed primarily for optical fiber communications to also communicate over unshiedled twisted pair networking cable. 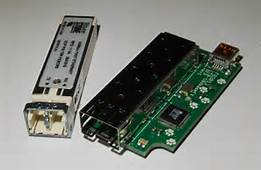 Commercially available transceivers have a capability of as much as 2.5 Gbps; A version of the standard which has a bit rate of 10 Gbps exists, however it can be used only to connect nearby equipment. It is very useful to reduce space and power consumption, and typically used as an interface within the client cards of line equipment and co-located racks or modules. Modern optical SFP transceivers support digital monitoring functions based on the industry standard SFF-8472 MSA. These functions give the provider, or user, the ability to monitor real-time parameters from the SFP; For example optical output power, optical input power, temperature, laser bias current, and transceiver supply voltage. SFP transceivers are designed to support SONET (“Synchronous Optical NETwork”), Gigabit Ethernet, Fibre Channel, and other communications standards. The standard is expanding to SFP+ (SFP plus), which will be capable of supporting data rates as high as 10.0 Gbps (that will cover the data rates for 8G Fibre Channel, and 10 GbE). Source: ArticleSnatch by Author Morph at FiberStore .